Question: What do Into It. Over It.‘s Intersections and Autumn have in common? Answer: They both render one nostalgic for a simpler time, back when overly analytical dialog a la Dawson’s Creek, flannel and Chuck Taylor’s were hot instead of retro. Oh the days! First kisses and cider and ponderous mulling over what that backward glance meant in gym class now versus last year…how time flies. Relatively, that is. There’s nothing wrong with garage rock. Nor is there anything wrong with being thrown backwards into the late ’90s/early ’00s, a pivotal musical phase. It was a great time. 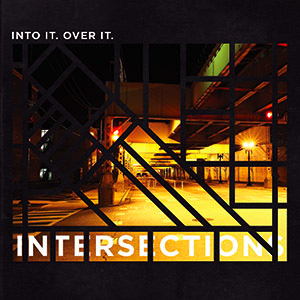 Several tracks from Intersections pay decent homage to three heavyweights of yore. (Pardon the agreement with Pitchfork’s review re: Death Cab For Cutie). In particular – “Favor & Fiction” and “Upstate Blues” display Ben Gibbard’s (Death Cab) sweet boy next door yelp. “Spatial Exploration” and “Upstate Blues” recall Weezer‘s signature no frills garage sound. Every track contains poetic, diary entry lyrics the likes of which were last captured with mass success by Brandon Boyd of Incubus. The “le sigh” moment of the album is a lack of eye widening originality. Nary a thin vein of dazzling gold nor a lone glittering diamond hiding in the cement gray rock of it all, waiting to be unearthed and glorified…But if all you crave right now as the seasons change is a familiar voice, Intersections won’t disappoint.